FDA “Cleared” Versus “Approved”: What’s the Difference? The question is sometimes asked, why is Alpha-Stim “cleared” by the Food and Drug Administration (FDA), as opposed to “approved?” Of course, all the medical devices in the U.S. market are examined by FDA to determine if they are safe and effective. All manufacturers who seek to market medical devices in the United States must first pass a very thorough process with the FDA through one of two pathways—the section 510(k) process, where a device is “cleared” for distribution, or the Premarket Approval (PMA) process, where a device is “approved” by the FDA. Today’s process stems from the Medical Device Amendments added to the Food, Drug and Cosmetic Act in 1976, establishing three regulatory classes for medical devices. Because there were devices already on the market prior to 1976, all devices were considered either pre-amendment medical devices, or new concept medical devices that had never been in commercial distribution (e.g., MRI, and lasers). The new devices had to undergo a PMA, a process that is significantly more expensive and difficult for the manufacturer, more like a new drug application ending in FDA “approval” due to the fact that there is no existing history of the medical device. In order to accommodate the pre-amendment devices, the FD&C included a clause in section 510(k), which states that if a medical device manufacturer can prove their technology is “substantially equivalent” to a type of medical device that was on the market prior to 1976, then the FDA can clear the device for commercial distribution using the slightly easier requirements of the section 510(k) process. Alpha-Stim® has gone through the section 510(k) process, and as a result is FDA cleared for interstate marketing and export for the treatment of anxiety, insomnia, depression and acute, post-traumatic and chronic pain. In its attempts to correctly classify the Alpha-Stim, Electromedical Products International has presented several “mini-PMAs” to the FDA over the years, along with a full PMA on anxiety in 1995. As a result, Alpha-Stim has endured more FDA regulatory requirements than most medical devices in U.S. history, including more than a half dozen extensive reviews of the safety and effectiveness of the technology along with post marketing surveillance, and biannual quality system reviews. In the end, FDA does not endorse any medical product, be it drug or device, and regardless of how a product enters the market, both FDA approval and FDA clearance are legally equal authorizations to market and export a device. The Alpha-Stim AID utilizes cranial electrotherapy stimulation (CES) to deliver the only rigorously tested and patented waveform that is clinically proven to treat anxiety, insomnia, and depression. 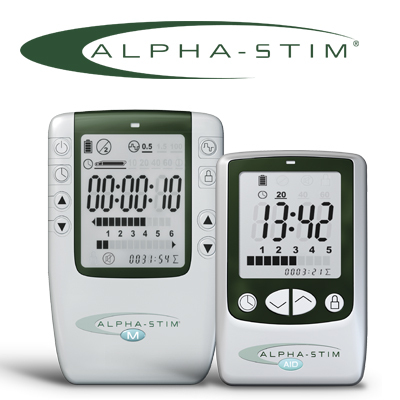 The Alpha-Stim M uses CES to treat mood and sleep disorders, plus microcurrent electrical therapy (MET) to also treat pain. Ready to learn more or get started with Alpha-Stim? We’re here to help! Give us a call today at 1-800-FOR-PAIN.